New game is coming and now Batman v Superman Who Will Win APK has been released with the current version 1.1. Ahead of the release of Batman v Superman: Dawn of Justice which will be coming soon in the near future, Warner Bros. International Enterprises released a waiting game to enliven one of the most awaited super hero films. This game is an endless runner genre game is not much different from similar games that are scattered in the mobile gaming market. You can choose between the leaders, Batman or Superman as a character in the game. Gameplay offered was similar to the endless runner like Temple Run or Subway Surfer, where you have to collect coins as much as possible while running and avoid various obstacles. 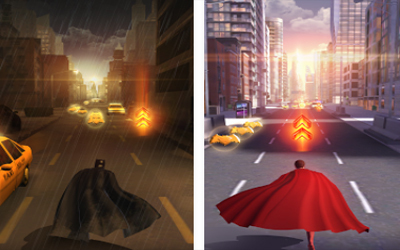 Various power-ups such as head start or magnets are also available to help you run as far as possible and record results for each super heroes. The specialty of this game is the audio-visual quality. You can see it from character which is polished with slick and environmental views of the city of Gotham and Metropolis quite charming. For the audio, this game is packed with the official soundtrack of the film Dawn of Justice and some sound effects that often you meet in a super hero themed film. Although the main purpose of this game is as film promotion, but the gameplay of Batman v Superman Who Will Win is quite interesting for you to play. So while waiting for the movie aired, it could not hurt to try this game on your smartphone and prove who is the better among these two super heroes. Choose your character, play as Batman or Superman. Explore your environment within Gotham and Metropolis. Control the Bat mobile, or fly with Superman. Collect free gifts when you go the distance. Official Movie Sound Track and and awesome sound effects. A variety of power-ups and pickups to upgrade. Performance fixes and improvements to movement sensitivity. Fantastic game for any dc fan puts you on the dark streets of gotham and the light streets of metropolis you can play as batman and superman but it is slow.